Various radial velocities associated with a south wind. Yellow is the direction the radar is pointing. Black arrows represents the wind direction and the length represents the wind speed. Blue arrow lengths represent the speed the radar "sees" along that direction. What separated the Doppler radar from previous generation NWS radars is its ability to detect motion. The motion it sees are primarily rain drops carried along by the wind but also can detect motions of insects, birds, and smoke particles. However, the only motion it can "see" is called radial velocity. This motion is NOT the direction of the wind but the portion of the wind's motion that is moving either directly toward or away from the radar. the motion along that radial (either directly toward or away from the radar). In the graphic at right, above, the wind is moving from south to north (indicated by the black arrows). North of the radar (red shading) the wind is moving away from the radar. As the radar sweeps from position 1 to position 2, the beam becomes more and more inline with the overall wind flow. As it does, the radar "sees" an increase in the radial velocity away from the radar. At position 2, the radial velocity is the same as the overall wind speed. Then, as the radar sweeps to position 3 the radial velocity begins to decrease. At position 4 (and 8) the wind is blowing perpendicular to the radar beam. Since there is no motion toward (or away) from the radar, it "sees" zero motion. However, the wind IS NOT calm at these points as it is still blowing from the south. This is just the area of zero radial velocity. 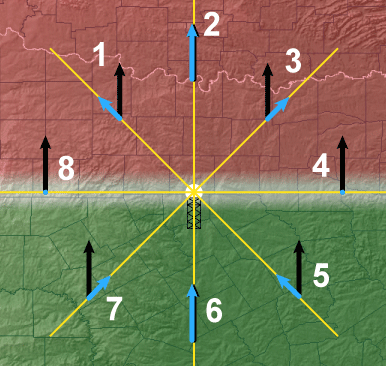 Positions 5, 6, and 7, in the green shading, are like 1, 2, and 3 in the red shading except the wind is moving toward the radar. The greatest radial velocity is at position 6 where the wind is blowing directly at the radar. These observed radial motions are vectors, meaning that the length of the arrows indicates the speed of the wind; the longer the arrow, the faster the speed. The Doppler radar calculates a velocity base on the length of these vectors and creates a color coded graphics for display. In these velocity graphics, red colors indicate wind moving away from the radar with green colors indication wind moving toward the radar. The brighter the reds and greens the greater the radial velocity and a more representation of the true wind speed. The NWS provides two velocity images: Base velocity and Storm Relative Motion. Base velocity, like Base reflectivity, provides a picture of the basic wind field from the lowest (½°) elevation scan. But to see the wind there needs to be radar "returns" before the radar can determine the velocity. In this comparison (right) (above) between the Base velocity and Base reflectivity, you will notice there is hardly any velocity information outside of the areas of precipitation. But with precipitation, Base velocity is useful for determining areas of strong wind from downbursts or detecting the speed of cold fronts. Remember, the radar beam elevation increases with increasing distance from the radar. Therefore, the reported value will be for increasing heights above the earth's surface. Also, know WHERE the radar is located in the image. The radial velocity colors only has the proper meaning if you know how it is blowing relative to the location of the radar. Outbound winds (red colors) on one radar might be inbound winds (green colors) at an adjacent radar. If the radar cannot determine (called range folding) inbound or outbound then it paints the wind in purple. When looking for rotation in thunderstorms (trying to determine if there is a tornado) the overall motion of the storm can mask any storm circulation as seen in a Base velocity image. If the overall motion of the storms is subtracted from the velocity, the wind circulation relative to the storm itself will become more evident. A loop of the Base Reflectivity, Base Velocity and Storm Relative Motion images to help investigate the storm located at #2. The Storm Relative Motion image is does just that. It is a picture of the wind circulation around a storm when the overall motion of the storm is subtracted. In effect, what is seen is the wind's motion as if the storm was stationary. As before, the radar will only see the radial velocity. For small scale thunderstorm circulations, from which tornadoes often form, will typically be indicated by strong inbound wind located along side strong outbound wind relative to the radar. When looking at Storm Relative Motion it is very extremely important to know where the radar is located. Tornadic circulations are cyclonic (counter-clockwise). So adjacent red and green colors need to be on the proper side in order to determine if there is a possible tornadic signature. The loop (right) (above) shows the comparison of the Base velocity and Storm Relative Motion. The yellow dot in the center of the image is the radar's' location. Recall from Base Reflectivity the notch in the precipitation pattern at #2. The Base velocity image shows mainly green colors. Just judging from the base velocity image, it might appear that there is only a strong inbound motion of gusty wind produced by the thunderstorm. However, when the storm relative motion image is teamed with the base velocity there is a clearer picture of the weather situation indicating a rotating thunderstorm. This is why no one radar image will provide a complete picture of the weather.